Michael J. Neely received B.S. degrees in both Electrical Engineering and Mathematics from the University of Maryland, College Park, in 1997. He was then awarded a 3 year Department of Defense NDSEG Fellowship for graduate study at the Massachusetts Institute of Technology, where he received an M.S. degree in 1999 and a Ph.D. in 2003, both in Electrical Engineering. He joined the faculty of Electrical Engineering at the University of Southern California in 2004, where he is currently an Associate Professor. 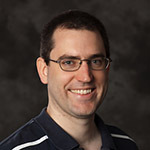 His research interests are in the areas of stochastic network optimization and queueing theory, with applications to wireless networks, mobile ad-hoc networks, and switching systems. Michael received the NSF Career award in 2008 and the Viterbi School of Engineering Junior Research Award in 2009. He is a member of Tau Beta Pi and Phi Beta Kappa. MIke's research is in the area of stochastic network optimization. This includes analysis and design for wireless networks, computer networks, ad-hoc mobile networks, and general queueing systems. Examples of his work include energy and throughput efficient scheduling in networks with random events and an unpredictable future.